While lying in bed as Madeleine tries to go to sleep, she is suddenly very awake and full of ideas. Bus ideas. Certain topics seem to just be a way to prolong the going-to-bed process, but when she’s got “good ideas” I like to let them flow. 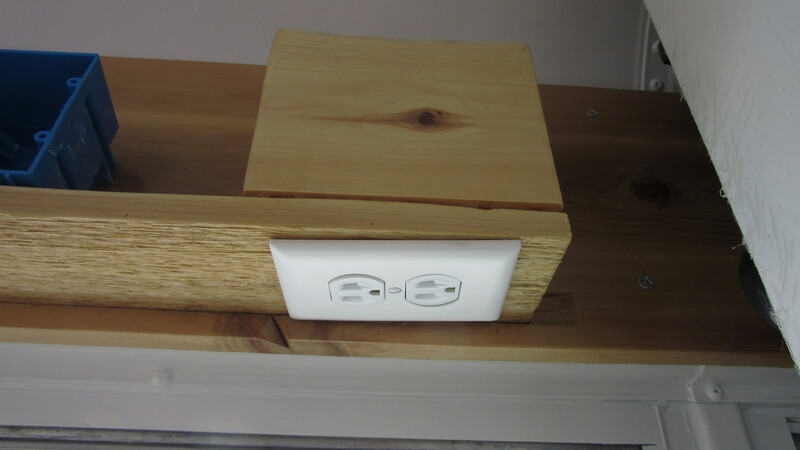 Her first idea was about the desk we are going to have in the girls’ bus bedroom – she wants it to be a board that comes out of the wall, without sides, just the supports it needs. 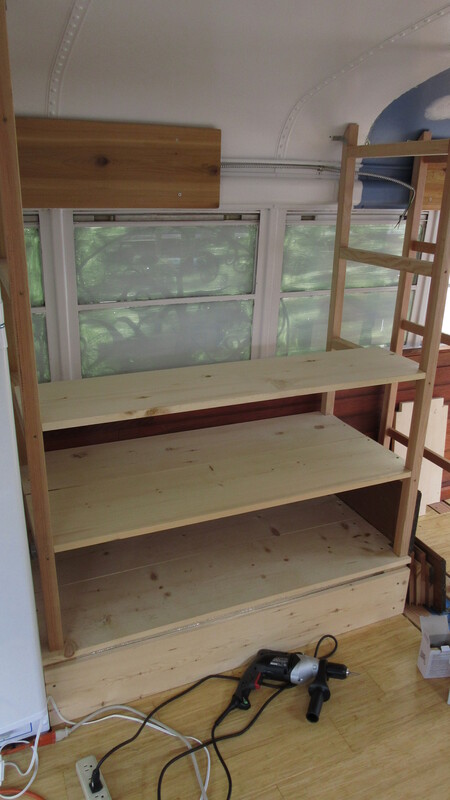 Then she wants drawers to be attached under it. Which I hadn’t thought of doing, and I think it’s a great idea! Check! 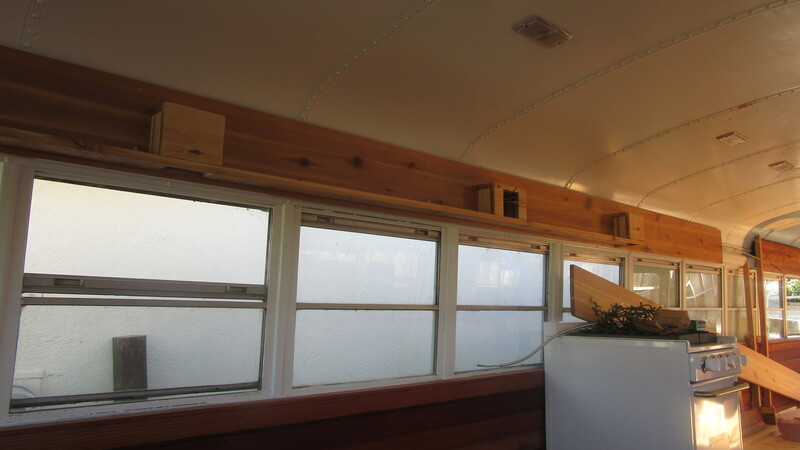 Second idea: about the bathroom for the bus (our current idea is to have a separate tiny trailer that has a bathroom…) – first thing she wants is a hanger in the bathroom for hanging towels on, and another for hanging bathrobes on. This seems easy enough. Her other idea is to have drains in the floor under the hangers so that if we hang up wet swimsuits or wet towels the water that drips out will go down the drains. This one seems challenging, but I love the creativity! 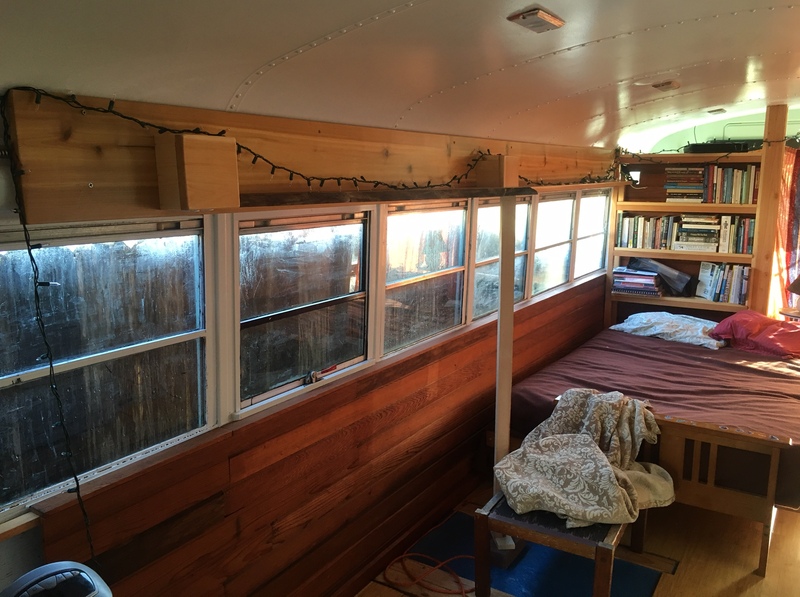 Fourth idea: She wants a round wooden room INSIDE her room on the bus that is “really big” (have we been reading too much Alice in Wonderland? 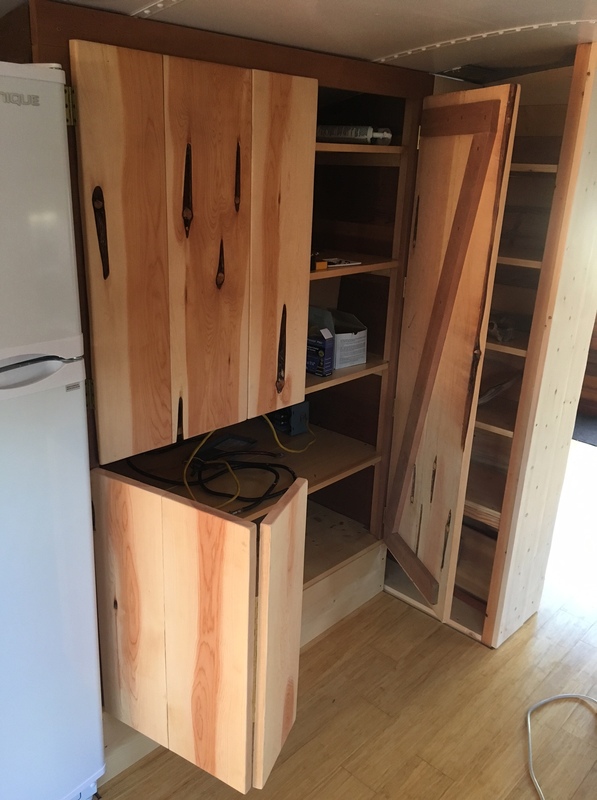 ), and it’ll have a door, and then we’ll make a loop of beads on a string “with no clasp, just a circle of beads” that will go through two holes in the door and the beaded circle will be the handle for the door. We’ll pull it open by grabbing the beaded circle… and at this point she paused, and was in deep thought, and then talked about how we would push the door from the other side to get out of the room, also using the beaded circle… I felt like I could almost hear the gears spinning in her head as she was visualizing the door and how she’d pull it from one side and push from the other, and how that would work with the handle she was creating in her head. The room, she says, would be for typing on computers and going into when you are mad and need to calm down. The ideas she comes up with are sometimes totally impossible or totally impractical, and often they are totally brilliant and totally creative and ALL of them are totally awesome, because she is so uninhibited by the rules of practicality and feasibility that the rest of us usually operate under. I love seeing her mind develop and delve into figuring out ways to solve a problem or create something she wants to have around. A couple weeks ago she said something about wanting to be a builder – I told her she’s lucky to have a family that also wants to learn about building, so we can do it together. And I think we’re pretty darn lucky to have her with us, too – she brings in fresh ideas and inspiration that we wouldn’t have had on our own! 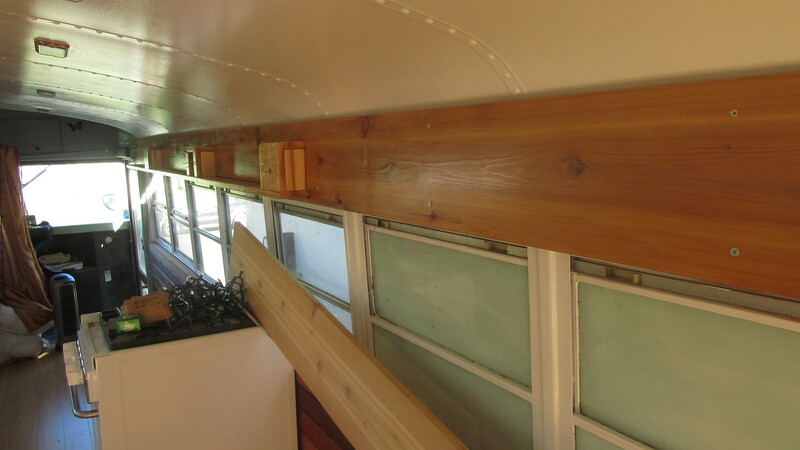 Here is the most recent addition to the bus – a wall! 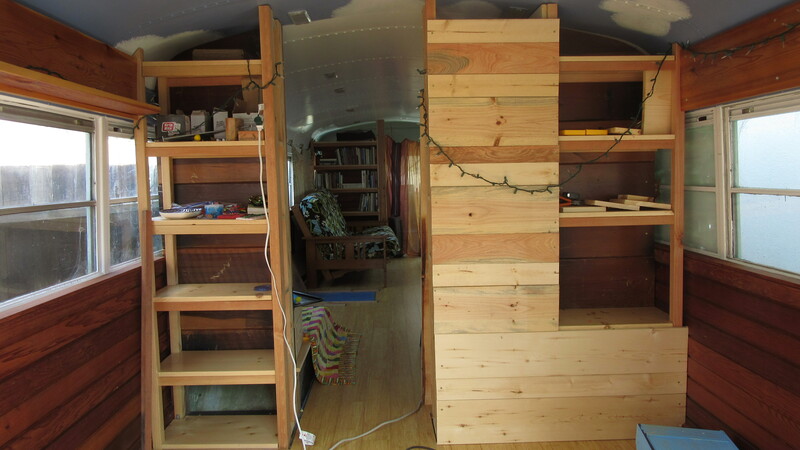 Almost done separating the girls room from the rest of the bus! 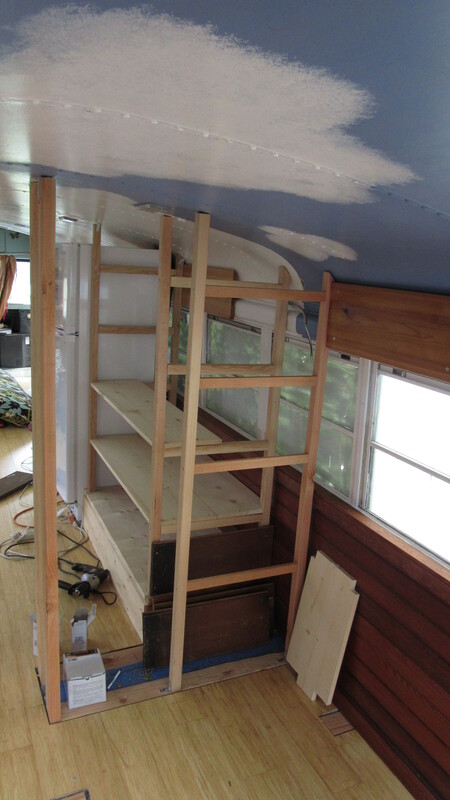 (And the gap at the top of the wall will be filled in, I just ran out of wood bits – got one today from a neighbor!). 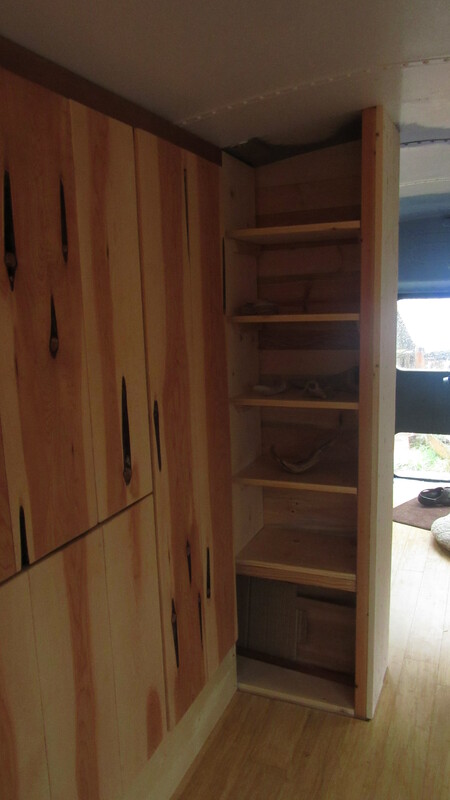 And we’re working on pantry doors – beautiful juniper wood that smells great. Between roadtrips and reducing our chicken flock, progress has been slow lately. Soon I’ll be back at it!! 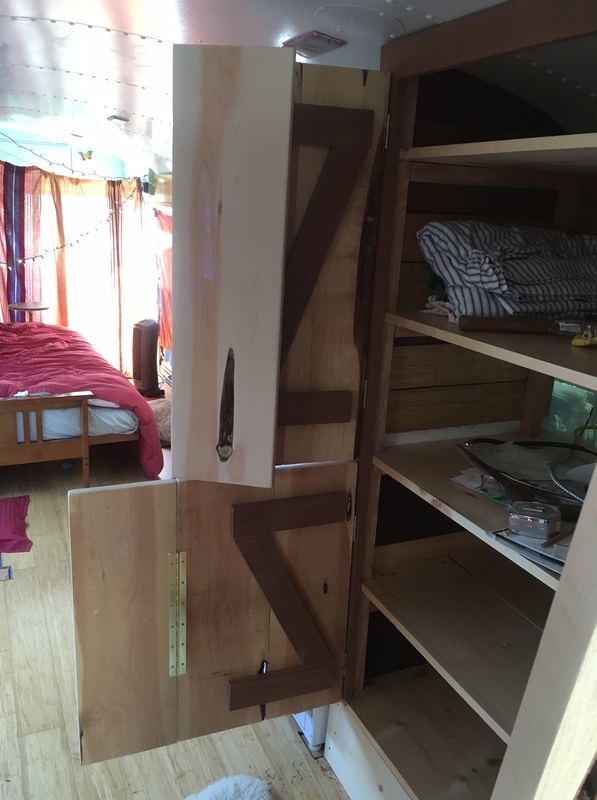 Chaos and change… in the bus! 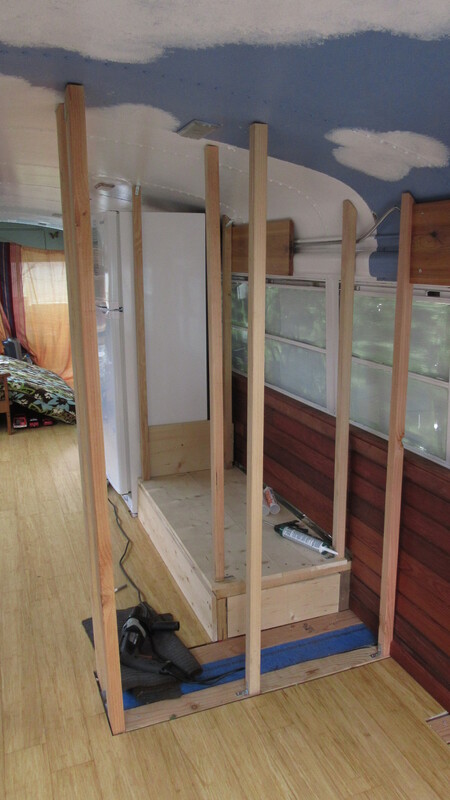 I just saw a quote that says, “All great changes are preceded by chaos,” which seems an appropriate way to start off a post about the bus progress. 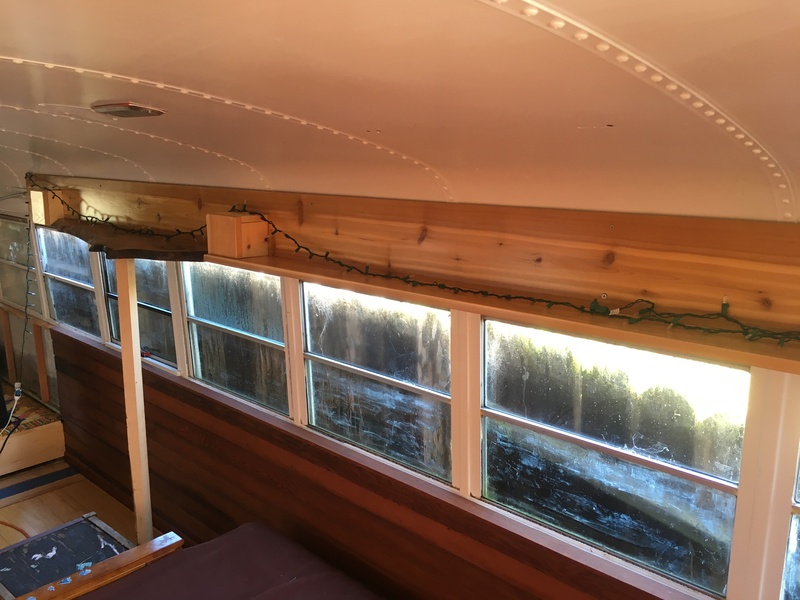 It seems there is constant chaos right now in the bus, with boxes of screws in various places, random pieces of boards, extension cords, wiring tools, empty boxes and baggies that haven’t found their way to the trash can yet. 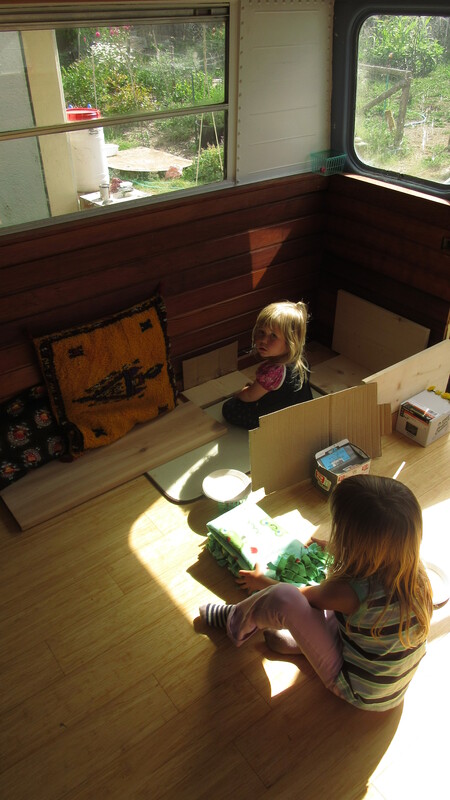 Added to the chaos of construction detritus are items brought in by two young girls – there is a table in the back with watercolors and beads, and as soon as a shelf is made, it becomes a bunk bed for dolls or stuffies. The futon is constantly employed as a trampoline, or slide, or small house for all the babies. Worlds of imagination created out of the ordinary mess of life and out of the chaos there is an emerging order, at least at times we see evidence of it. 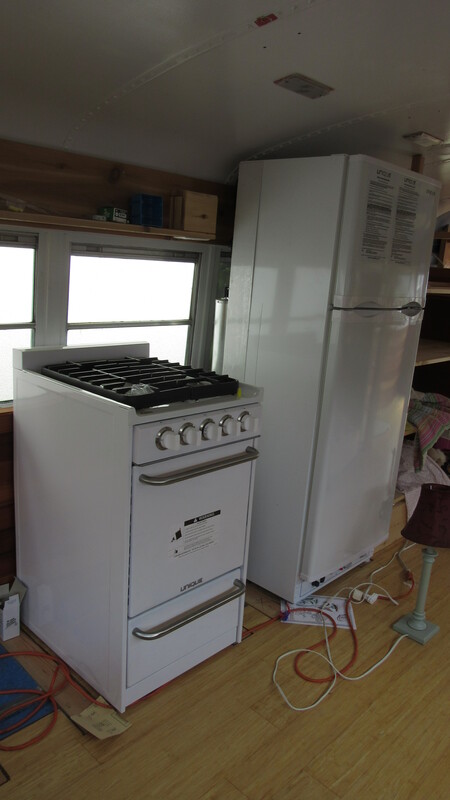 We put in the stove and refrigerator! Hooray! The stove is propane and the fridge is propane or AC-powered, both from Unique. 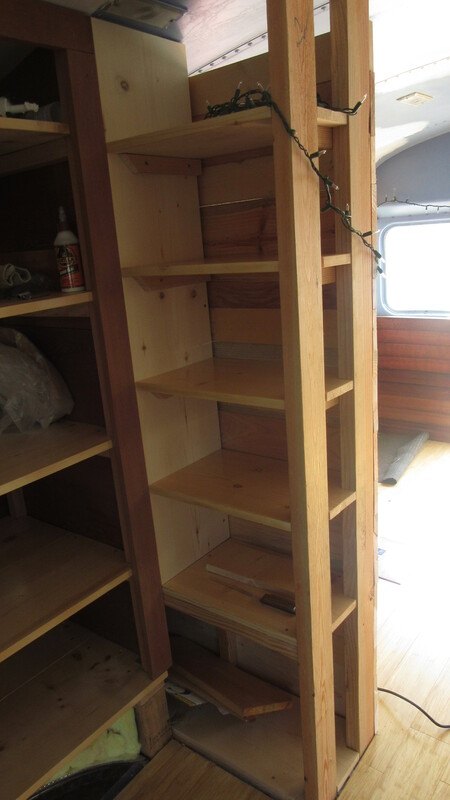 And the shelves start going in! 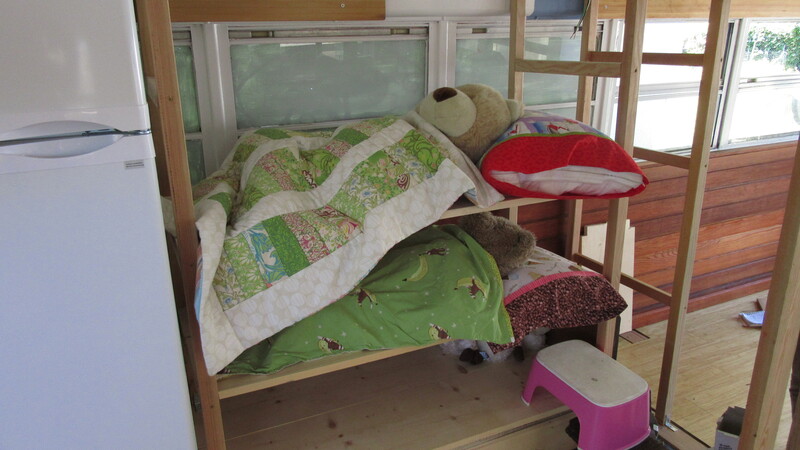 As soon as the shelves were put in, they instantly became bunk beds for the girls’ favorite bears. 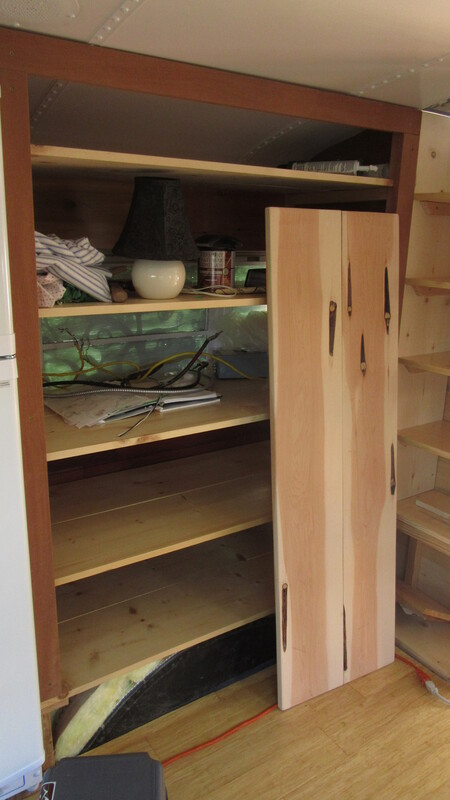 Now I am working on prepping the boards that will enclose the pantry, and the shelving for the girls room. 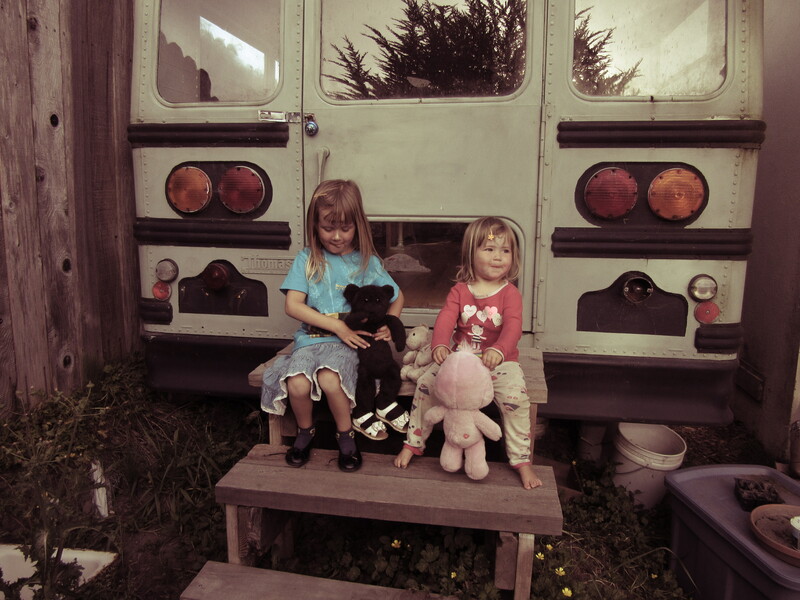 With the lengthening days and warmer weather, I feel such a rush of momentum to be outside working, and it helps that the girls can play and help while I’m putting things together. 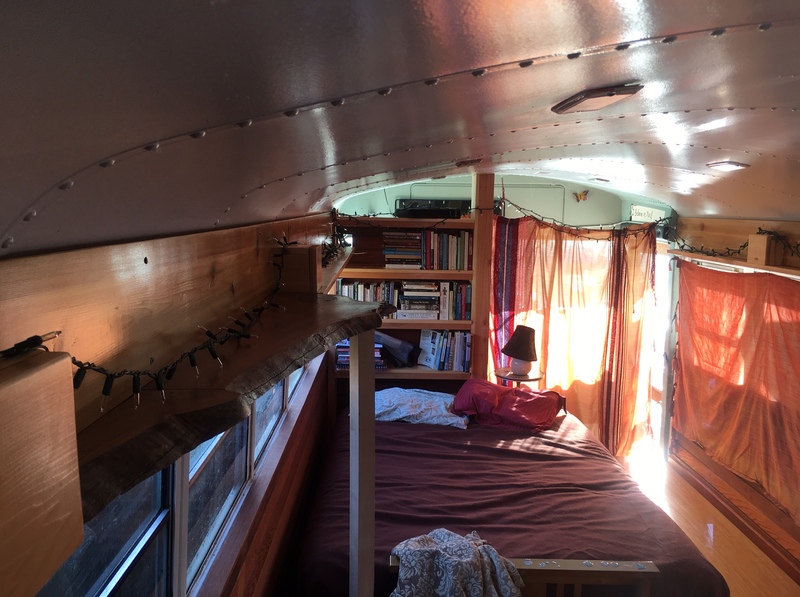 I love to see Maddie feel ownership and excitement over the bus project – she is involved, she knows what’s going on, and she gets very excited to show others what we’ve been working on. Perhaps Juniper feels all that, too, but it’s hard to tell – one thing I do know is that she really loves to bounce around and play in there!